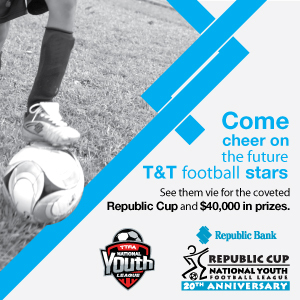 There will be a new champion in the Under-15 age group of the Republic Bank National Youth Cup. Defending champions Point Fortin Civic Centre (PFCC) crashed out of the South Zone yesterday after 1-0 and 2-0 losses respectively in their only two group games, as action continued yesterday in the 2015 edition of the national youth tournament at Guaracara Park in Pointe-a-Pierre. 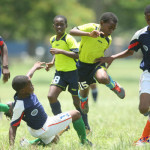 Photo: A Trendsetter Hawks player (centre) tries to shake off attention from a Santa Cruz FA player (left) during 2015 Republic Bank National Youth Cup action on Saturday at the Queen’s Park Savannah. 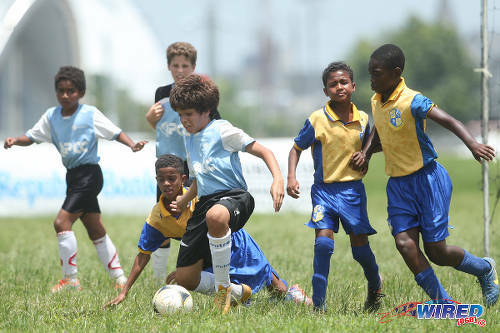 Uprising Youths emerged victorious instead and will represent south Trinidad in the Under-15 category when the tournament’s quarterfinal round kicks off on Saturday August 22 at Constantine Park in Macoya, Tunapuna. 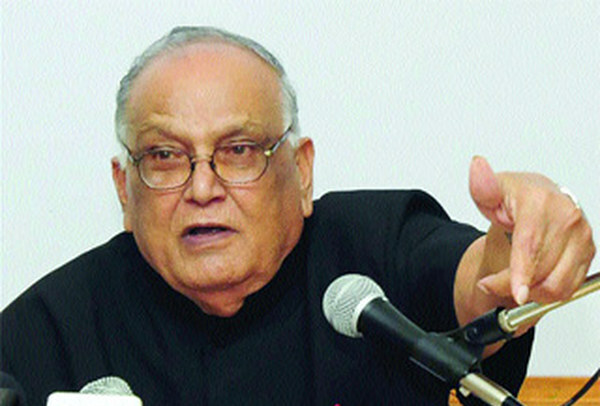 Uprising also topped the Under-11 category with three successive victories. It was such a breeze, in fact, that the focus deviated from results to aesthetic endeavours by their last game. “Allyuh look good, look good!” shouted one fan. 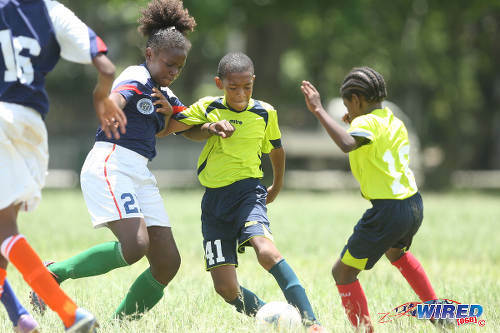 In the Under-13 division, the impressive La Brea-based WEZ Pro team topped their group with three victories and as many clean sheets. 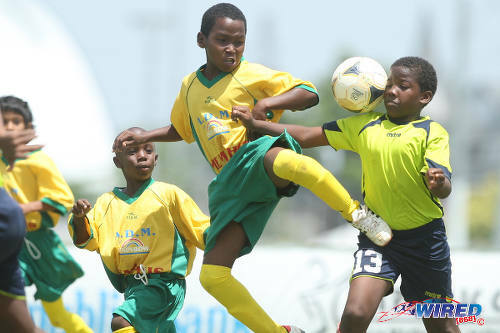 WEZ Pro and Uprising joined fellow southerners San Fernando SA (Under-13) and Marabella Family Crisis Centre (Under-11), who had already booked their places in the knockout rounds. It was WEZ Pro’s debut in the Republic Bank tournament and, marshalled by coach Shakeem Darius, they used a 4-4-2 formation and were highly effective, simple and direct. Photo: WEZ Pro players prepare for kick off during Republic Bank National Youth League action yesterday in Guaracara Park. Darius’ four defenders rarely crossed the half-line and did not linger in possession while their midfield, led by captain Isaiah Neptune, moved the ball around quickly and attackers Caesar Williams and Rashad Webb, the son of former Trinidad and Tobago international Wesley Webb, were a constant threat on top. 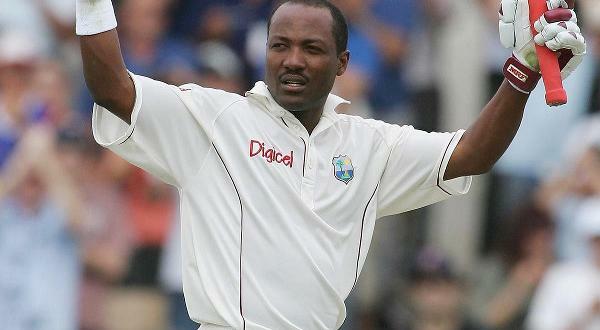 Webb, who is heading for Form Two in Presentation College (San Fernando) next month, was a treat to watch on the ball. Ste Madeline barely got within sight of WEZ Pro’s goal area in the first clash of the day while three goals in the space of six minutes from Webb, Atiba Augustus and Caesar Williams respectively ensured a comfortable triumph. Point Fortin edged Uprising 1-0 in their meeting at Under-13 level, thanks to a goal from captain Ezekiel Kezar, although the result was harsh on the latter team from Gonzales Village, whose performance married tactical discipline, effort and skill. Webb’s wizardry was key in the Under-13 group decider, though, as—with chants of “La Brea! 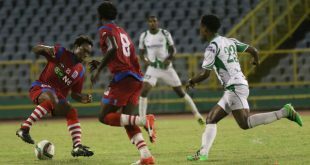 La Brea!” ringing out from their supporters—WEZ Pro proved too much for Point. 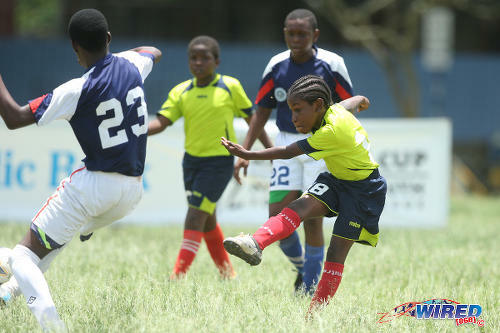 Photo: A Trendsetter Hawks Under-11 player shoots for goal against the Santa Cruz Under-13s during Republic Bank National Youth Cup action at the Queen’s Park Savannah on Saturday. Webb and Neptune got the two goals and the young men, along with teammate Augustus, credited “working together” as the key ingredient in their success. Only two clubs participated in the Under-15 category as Club Sando turned up with just six players while Gasparillo Youths, which is based just five kilometres away, did not appear at all. 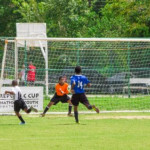 Officials from the three clubs blamed their weakened states on a Trinidad and Tobago National Under-15 team training session, which is ironic since the Republic Bank competition serves as the Trinidad and Tobago Football Association’s official youth competition. 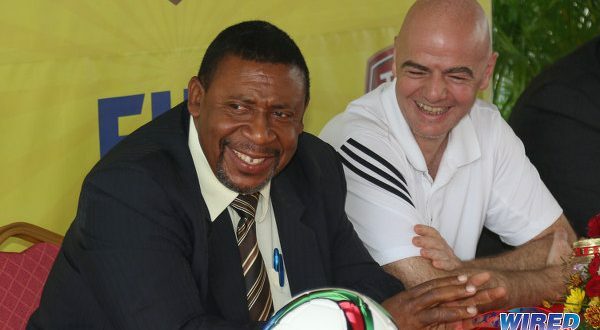 CONCACAF cancelled its National Under-15 competition almost two months ago. 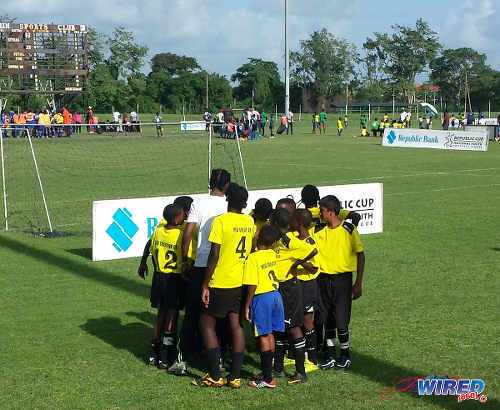 Point Fortin and Uprising faced each other twice to decide which team would represent the South Zone in that category. But the matches were dull and lacked impetus. 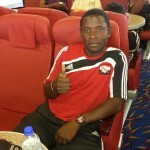 But Gyasi Jeffrey did have something to prove. He was last year’s Under-14 MVP at goalkeeper as Point Fortin lifted the national title. However, Jeffrey switched allegiances to Uprising because, according to the player, he prefers to scores goals rather than stop them and he receives better coaching at his new team anyway. The Point Fortin West Secondary student, who played upfront, rubbed salt in the wounds of his former teammates with a flicked goal off a corner kick that virtually ensured PFCC’s elimination and propelled Uprising to the Under-15 quarterfinals in Macoya. Uprising Youths were even more emphatic in the Under-11 category where they scored four times and never conceded. This age group provided the most passionate play, filled with rapturous cheers and jubilant celebrations. Photo: A QPCC player (centre) takes on all comers in a contest with SKHY FC during the Republic Bank National Youth Cup at the Queen’s Park Savannah on Saturday. 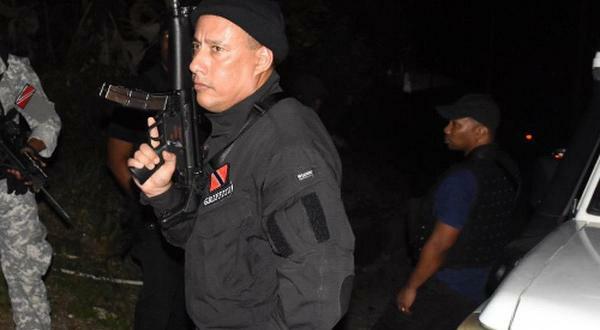 Former “Strike Squad” stand out, Philbert Jones—the uncle of current “Soca Warriors” captain Kenwyne Jones—had two sons, Jaylon and Daniel, in the WEZ Pro Under-11 team. But, this time, the debutantes would not taste success. Point Fortin Civic Centre edged WEZ Pro 1-0 when they met up and it sparked the celebration of the day as scorer Joel Guichard sprinted for about 40 yards with his arms extended like Cristiano Ronaldo while his teammate and goalkeeper lay supine on the ground shaking his fists in elation. 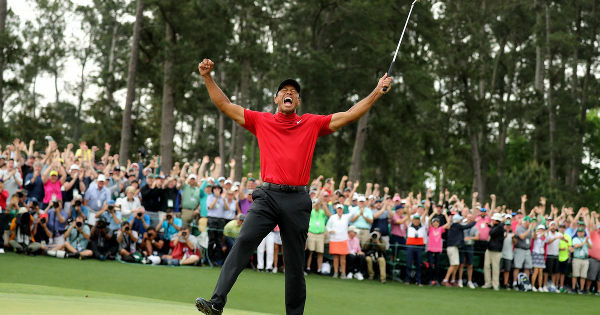 It was quite a theatric response to a converted penalty kick. Good article Kerwin, well organized tournament by people who know how to manage sport. Nice, relaxed writing. Good commentary Kirwin!